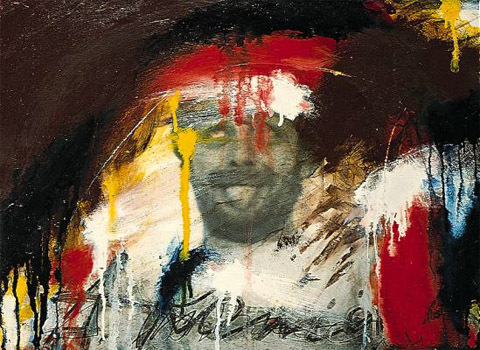 Increasingly through the twentieth century, and especially after the stranglehold exerted by Abstract Expressionism, powerful and idiosyncratic art has often been made against the prevailing ethos and in response not to theory but to a desire for directness and immediacy of experience. Nevertheless the proliferation of new movements at an ever accelerating pace has been one of the most marked characteristics of art since the early 1960s. The tendency for artists to react consciously against the tenets of their immediate predecessors, combined with their need to combat the isolation of the studio through friendship with other colleagues, has led repeatedly to the formation of new groupings often further encouraged by critics, dealers and museum administrators keen to be first at the scene of every new artistic development. There has been a widespread anxiety not to be left behind, like the conservatives who had resisted the rise of Modernism at the turn of the century. This has engendered an atmosphere conducive to experiments remote from the taste of the public at large. The pressures of a constantly growing and more powerful market for contemporary art during this period have likewise exercised a strong influence, especially in the United States, which has come to dominate a more genuinely international art world both in terms of its art criticism and the commercial gallery system centered in New York City. The effects of economic forces have been manifest not only in a sometimes grotesque parody of the built-in obsolescence of the consumer society, which requires new status-bearing products every season, but in the reaction of artists who have sought to subvert the system altogether by abandoning the manufacture of saleable commodities in favour of art forms which do not lend themselves so easily to such manipulation: for example Conceptual Art, Video art, Performance Art and Land art. Given the existential emphasis within Abstract Expressionism, by which every brushmark was judged an authentic sign of the artist's personality and a gesture indicative of his or her free will, it was almost inevitable that subsequent generations would seek a demystification of both process and content as a release from this romantic inwardness. Such impulses were central to the origins of Pop Art in the 1950s and to the evolution and influence of the movement in the following decade. Indications of this shift in the late 1950s occurred also in the work of American artists such as Helen Frankenthaler (born 1928) and Morris Louis (1912-62), whose variations on the procedures of Jackson Pollock's drip paintings largely stripped them of their implications as a form of handwriting conveying emotion; Louis in particular stressed simple actions, such as staining the canvas with rivulets or pools of thinned acrylic paint applied by pouring, to draw attention to the material properties of the painting as a flat surface suffused with colour. 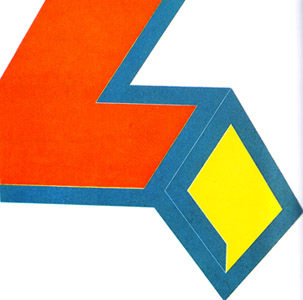 One of Louis's close associates, Kenneth Noland (born 1924), while also favouring acrylic paint stained into rather than brushed on the canvas, introduced into his work a strong formal design as a structuring device for an art of colour and surface. 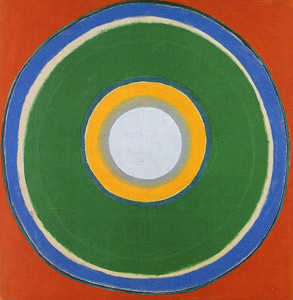 In a number of paintings of the late 1950s and early 1960s he used a target-like motif of concentric rings of colour not as a way of expressing an ironic equivalence between the painting and a real object, as had been the case for Jasper Johns a few years earlier, but as a container for precisely judged relationships of hue; among the diverse precedents for this art of colour and geometry one could thus cite the Orphism of Robert Delaunay and the almost scientifically rigorous Homage to the Square paintings of Josef Albers (1888-1976). Louis, Noland and Frankenthaler, along with other artists such as Frank Stella (born 1936), Ellsworth Kelly (born 1923), Al Held (born 1928) and Jules Olitski (born 1922), were grouped together by the critic Clement Greenberg under the banner of Post-Painterly Abstraction in an exhibition held in 1964. As the label suggests, Greenberg saw in these artists a shared reaction against the importance accorded to painterly gesture in certain types of Abstract Expressionism, arguing their case as a search for the essence of painting as a medium of flat coloured surfaces. Kelly, who was older than most of the artists in this group, had been working independently since the late 1940s on the creation of a concise language of geometric form, initially in painted wooden reliefs inspired by modern architecture; by the early 1960s his preference for clearly outlined brightly coloured shapes led him to being identified as one of the originators of Hard-Edge Painting. Like many labels, this is misleading in its emphasis on a minor technical aspect of the work, as Kelly's concern was not simply with linear definition but with relationships of shape and colour and of self-sufficient form to nature. Another term which is sometimes applied to such work and to that of older American artists such as Barnett Newman and Mark Rothko is Colour Field Painting, which more helpfully emphasizes a shared concern with the effects of saturated hues over a large surface. The proliferation since the 1960s of terms, as of movements, needs to be treated with a certain amount of scepticism: what begins as a useful shorthand for identifying a common purpose may all too quickly degenerate into a restrictive label. 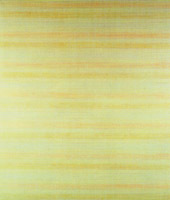 Although Post-Painterly Abstraction was destined to remain more a convenient label than a coherent and lasting movement, it did help to define the parameters of much of the art produced during the 1960s: in its elimination of the personal touch as a sign of the artist's personality it heralded the anonymous surfaces of movements as diverse as Pop Art, Optical Art and Minimal Art; in its insistence on logic it set the tone for Conceptual Art just as in its concentration on the most basic and essential attributes of painting it prefigured Minimal art; and in its concern with stripping bare the physical properties of each object as the result of a sequence of actions it provided a background for an emphasis on process in the work of other artists later in the decade. Greenberg's immense influence and single-mindcdness as a critic, while doing much to establish the reputations of the American artists he promoted, ultimately undermined the position of those who were judged to be too much under his control, especially when his exclusivity and formalist bias gradually lost favour. The artists whose work continued to develop and to affect the course of art, at least in America, were those who, like Stella and Kelly, had maintained a more independent stance from the beginning. In the late 1950s and early 1960s Stella produced some of the most austere and demanding paintings of the period, initially in single colours - black, aluminium and copper - and soon after in combinations of bold primaries. Provocatively rejecting the lofty philosophical intentions of the Abstract Expressionists, he insisted that 'What you see is what you see', by generating simple patterns of uniform stripes as a direct response to the structure of the painting as an object: each stripe, painted in a flat, unmodulated and unmixed colour, corresponded in width to the wooden stretcher bars supporting the canvas. Large in scale and subject to severe rules of logic, Stella's paintings appeared to be wiping the slate clean in preparation for a re-examination of the properties of the medium. Starting with the most extreme economy of means, during the 1960s he gradually added to his repertoire increasingly complex elements: he explored contrasts of colour, abandoned the conventional rectangle for a variety of shapes still self-evidently generated by the underlying structure and introduced interlaced semi-circles that replicated the standard shapes of draughtsman's tools. By the late 1970s he had abandoned all vestiges of restraint in large-scale metal reliefs in which vigorously thrusting shapes are luxuriantly covered in exuberant and seemingly arbitrary patterns and marks as if recklessly parodying the frenetic gestures of his Abstract Expressionist forebears; while in such works he may seem to have contradicted the logic and certainly the austerity of the art by which he made his name, through all these changes he has continued to insist on the appropriateness of one of the original definitions of Modernist painting as the decoration of a (flat) surface. The matter-of-factness exemplified by Stella's paintings came to be a dominating feature of much of the art produced in the 1960s. In sculpture the American David Smith (1906�65) had begun as early as 1933 to ally his artistic process with steel welding techniques, culminating in the Cubi series (1961�65) whose burnished surfaces and metallic sheen have great painterly richness. Smith virtually redefined sculpture's premises about materials and methods, and its relationship to the base and the environment, while such formal concerns were matched by powerful emotive content. 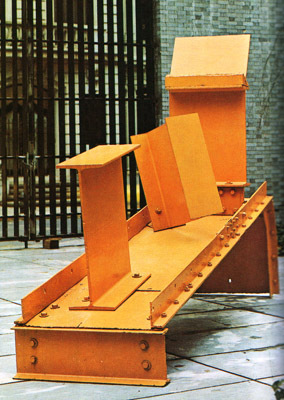 His influence on sculptural developments was as great as that of the Abstract Expressionists who were his contemporaries, and his ideas were taken further mainly by the Englishman Anthony Caro (born 1924), one of the most eloquent and influential younger sculptors. After meeting David Smith and Clement Greenberg on a visit to America in 1959 he began to produce brightly painted welded steel sculptures in which he left intact the industrially produced components as a means of stressing his concern with formal relationships; this was in stark contrast to the traditional emphasis on imagery and on the transformation of materials which continued to characterize the work of Henry Moore (1898-1986), for whom Caro had worked as an assistant in the early 1950s and who continued to be regarded as a major international figure in the grand tradition. Through his teaching at St Martin's School of Art in London Caro helped redirect the course of sculpture in Britain; among his former students who came to prominence at the Whitechapel Gallery's Mew Generation exhibition in 1965 were Philip King (born 1934), whose often fanciful variations of geometry were fabricated from industrial materials including plastic and fibreglass, Tim Scott (born 1937) and William Tucker (born 1935). One of the most striking characteristics of Caro's work was his elimination of the conventional pedestal which had traditionally elevated sculptures from the environment in which they were sited. The supports for Caro's constructions were part and parcel of their construction, a straightforward device through which he was able not only to articulate the way in which form followed function, as had long been the case in Modernist architecture, but to seek a more democratic confrontation between his work and the spectator by acknowledging their interaction on the same literally down-to-earth level. A similar urge to involve the viewer directly motivated other tendencies during this period, in particular Optical Art and Kinetic Art. For Op artists such as the English Bridget Riley (born 1931), the French Victor Vasarely (born 1908) and Francois Morellet (born 1926), the most pressing concern was with the act of perception itself, with the dazzling and often disorientating effect on the eyes of particular patterns of line, shape and colour. By definition such images require the active response of the spectator in order to take effect. While much Op art depended for its effect cm phenomena that had been more ably investigated by scientists, in the hands of its most sophisticated practitioners it proved to be far more than a passing fashion or gimmick in spite of the speed with which it was consumed and imitated within popular culture in the wake of exhibitions such as The Responsive Eye (held at the Museum of Modern Art, New York) in 1965. 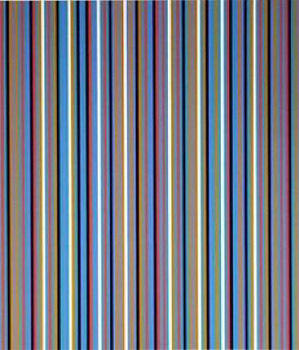 Riley, for instance, followed her purely black and white paintings of 1963 with canvases of coloured stripes, deployed either as parallel lines or as wave patterns of alternating thickness, which functioned in many different ways. In some cases no more than three colours might be juxtaposed in a variety of configurations in order to create an illusion of an immense variety of colour by purely optical means involving after-images. Within the strict limits of her formal vocabulary she was able to continue such investigations throughout her later work in endless permutations. Op Art is sometimes treated as a branch of Kinetic art, given that both are concerned with movement: either actual motion, as in Kinetic art, or implied or imagined action, as in Op art. 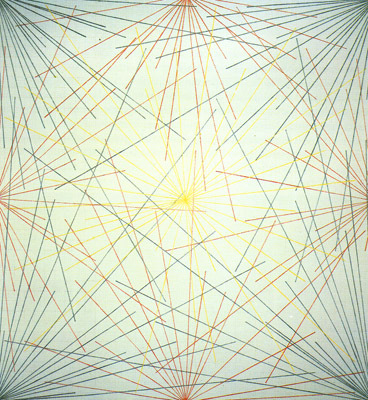 The dividing line between the two types can be ambiguous, as in the work of the Venezuelan artist Jesus-Rafael Soto (born 1923), who is best known for kinetic relief constructions in which constantly changing patterns are created by the optical interaction of forms suspended in front of a surface pattern of parallel lines. 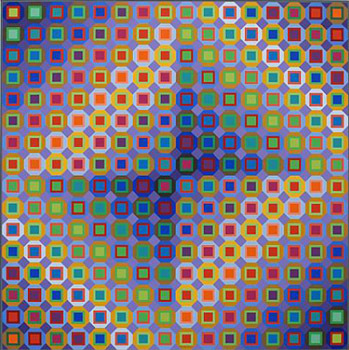 The quasi-scientific tone of much of this art can be gleaned from the very name of the Groupe de Recherche d'Art Visuel, the French group which during its existence from 1960 to 1968 numbered among its members Vasarely's son Yvaral (born 1934) and the Argentinian Julio Le Pare (born 1928). 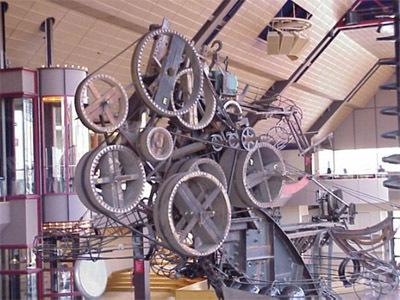 By contrast, however, other Kinetic artists introduced mystical and absurdist approaches to art in movement: the Greek artist Takis (born 1925) created eerie musical environments of suspended metallic objects activated by electromagnetism, while the Swiss Jean Tinguely (born 1925), a latter-day Dadaist, delighted in creating unwieldly clattering machines that endlessly repeated patently useless actions. 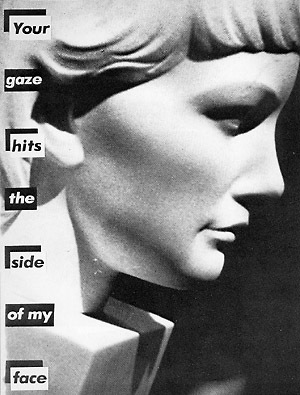 A desire for directness of confrontation with the spectator was also one of the motivating forces in the mid-1960s for the rise of Minimal Art, a movement which stressed simplicity of form and clarity of idea in the creation of paintings and sculptures as objects that could be apprehended in their totality virtually at a glance. Paradoxically the very sparseness of their means, particularly when removed from the defining context of a group of works conceived as a complete installation, guaranteed the almost complete incomprehension of the public at large when faced with works such as Carl Andre's Equivalent VIII, a rectangular solid formed by 120 standard bricks stacked in a simple formation in defiance of all traditional notions of technical skill and composition. Minimal art was taken to its most extreme logical conclusion by certain American sculptors, notably Carl Andre (born 1935), Donald Judd (born 1928) and Dan Flavin (born 1933), who made use of industrial materials, often in readily available prefabricated forms, for a sophisticated art of precise arrangement and interval. Flavin's structural elements, for instance, were fluorescent lights in standard lengths and colours, arranged in basic configurations or simply propped up as a single luminous line as a means of articulating or transforming the space of the room in which they were installed. A heightened awareness of place was essential, too, to the 'floor pieces' made by Carl Andre from metal plates laid edge-to-edge in a kind of chequerboard pattern, not only because the spectator was encouraged to stand on these works to experience their materiality and a sense of the space they occupied, but also because they were often conceived for particular gallery spaces or installed in such a way as to deflect attention onto the characteristics of the room itself. 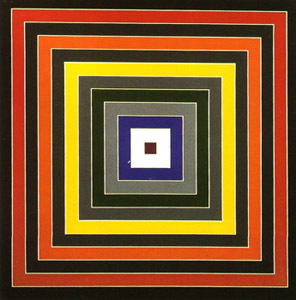 Both Frank Stella and Ad Reinhardt, with his dictum that 'Less is more', prefigured and influenced the emphasis on literalness that characterized Minimal Art; Reinhardt's 'black paintings' of 1960-66, each of which consisted of an almost invisible cruciform shape imposed on the dark background of a square canvas, were meant to look as much alike as possible so as to prepare the viewer to scrutinize the surface for almost imperceptible variations of hue and tone. With such works an initial imprcsson of immediacy, obviousness and emptiness, further encouraged by their display in series of nearly identical units, often gave way to an appreciation of the extremely subtle variations which occur both within a single painting or sculpture or from one work to the next. 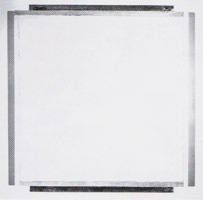 In the case of Robert Ryman (born 1930), for instance, every work he has created since the late 1950s could be described blandly as a white painting in a square format, but within these severe restrictions he has explored an immense variety of the properties of the medium: he has used different types of paint, ink and drawing materials (oil, acrylic, gouache, casein, enamel, gesso, emulsion, pastel) on supports ranging from stretched canvas, wood and paper to copper, steel and plexiglass; he has explored changes wrought by scale, different types of brushwork and variations in the relationship of the painted area to the edge; and he has drawn attention to the many ways by which the surface can be fixed to the wall. While remarkable for the clarity and single-mindedness with which he has systematically laid bare his medium, Ryman is not alone among Minimal artists in achieving a state of heightened sensibility. During an equally long development another American painter, Agnes Martin (born 1912), has specialized in paintings covered with washes of colour or pencilled grids of such delicacy as to be almost imperceptible in reproduction, each conveying highly specific experiences of light or landscape. Similarly the English painter Peter Joseph (born 1929) has focused his attention since the early 1970s on variations of a single format � a rectangle of a flatly painted colour surrounded by a border of a different hue - to convey introspective moods through the precise meeting of light and dark, that is to say, through the juncture of two colours in a particular proportional relationship. While Minimal Art proved flexible enough to accommodate such refinements of sensibility and emotion, it is for the often mathematical rigour of its logic that the movement remains best known. The sculptures of both Andre and Sol LeWitt (born 1929) have explored numerical permutations; Andre's much misunderstood brick piece, for instance, was one of four sculptures created for an exhibition entitled Equivalents in 1966 in which he stacked the same number of bricks in four configurations so as to stress the transformation of solid matter from a specific quantity of identical units. LeWitt, for his part, in the 1960s created room-size installations based on a grid formation in which he explored the changes that could be wrought to a form as basic as the cube; subsequently he made wall drawings generated by such strict principles that it could be left to others to execute them according to his instructions. Such reliance on assistants and even on industrial manufacture, which also characterized the work of Donald Judd, shifted attention from execution, which was assumed to be as impersonally perfect as that of a mass-produced industrial object, to the form as the material evidence of an idea. 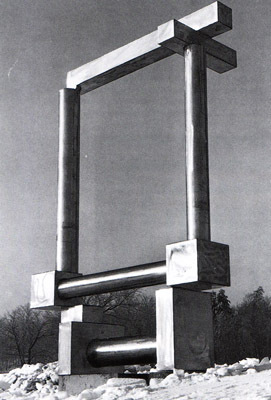 Judd was consistently concerned with the properties of different materials - among them plywood, galvanized iron, stainless steel, anodized aluminium and plexiglass - and with questions of spacing and proportion as structuring devices no less rigorous than those employed in classical art and architecture. Minimal Art proved to be much longer-lived than might have been expected of a movement predicated on such notions of simplicity, both in the hands of its original practitioners and in the variations created in its wake. 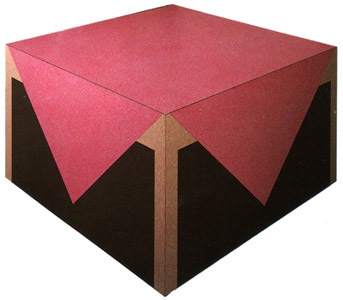 As early as 1964, a year before the movement had even been named, another American artist, Richard Artschwager (born 1924), was creating sculptures made of formica on wood in which the standard Minimalist cube was transformed into an image of an ordinary object such as a piece of furniture; at once an illusion and a literal account of its identity as an object manufactured from modern synthetic materials, it proposed unsettling questions about such essential matters as representation and the function of art. Among other artists who maintained an idiosyncratic relationship with Minimal art was the Austrian-born British painter Peter Kinley (1926-88), who from the mid-1960s employed a representational language of emblematic simplicity to convey highly personal responses to nature, animals and domestic life. 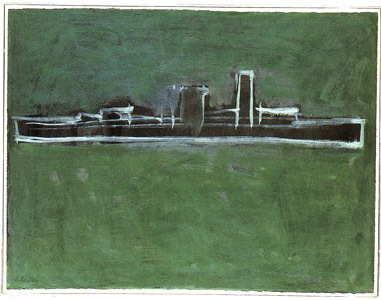 In a later work such as Battleship (1985), for instance, an image generally considered sinister materializes in brushwork of great tenderness; the artist acknowledged that far from being an image of militaristic aggression, he conceived it as a metaphor or vehicle for his own sense of resilience and fortitude at a time of his life when he felt isolated and under siege. 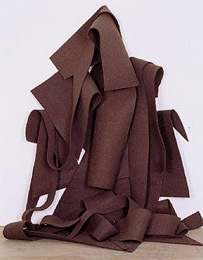 While never considered to be Minimalists, Kinley and others who have similarly used a representational language of extreme economy, such as Susan Rothenberg (born 1945), have continued to demonstrate the possibilities of such forms for the expression not only of rigorous logic but also of intimate emotion. 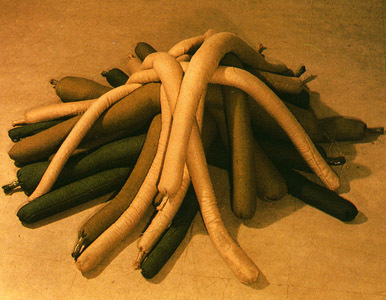 One of the American artists associated with the origins of Minimal art, Robert Morris (born 1931), was also instrumental in the development from Minimalism of types of art which stressed the process by which they had come into being. In an influential article titled 'Antiform', published in Artjorum in April 1968, Morris rejected form as an end in itself in favour of chance and indeterminate methods and materials which gave rise to objects of an ephemeral or changeable nature. Among the methods cited by him were 'random piling, loose stacking [and] hanging'. His materials could be as evanescent as steam and as malleable as felt, from which he made a number of large hanging works in the late 1960s and early 1970s; some of these bore more than a passing resemblance to paintings by Jackson Pollock and Morris Louis which had prefigured such an insistence on chance methods and shapes induced by process. Process art, while never clearly identified or promoted as a coherent movement, was nevertheless an important force in American and European art by the end of the 1960s. 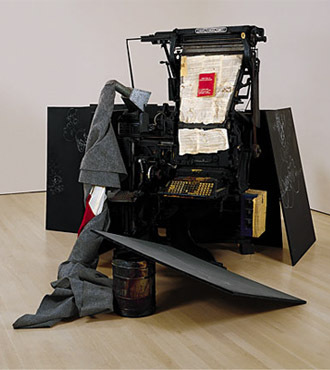 Early in the decade the Pop artist Claes Oldenburg had begun to make sculptures representing ordinary objects on a heroic scale in both 'hard' and 'soft' versions, drawing attention to the characteristics of contrasting processes and materials in generating forms; from such experiments in malleable shapes a new type of sculpture emerged which became known as Soft art. 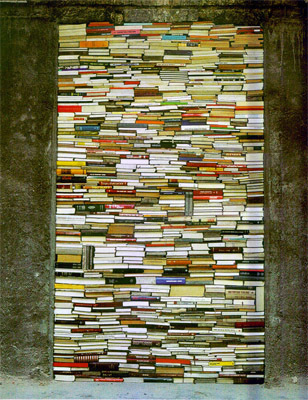 In Europe much of this work, favouring materials previously deemed inartistic, was presented under the banner of Arte Povera; among the artists associated with these developments were the German Joseph Beuys (1921-86), along with the Italians Mario Merz (born 1925), Giulio Paolini (born 1940) and the Greek-born Jannis Kounellis (born 1936). 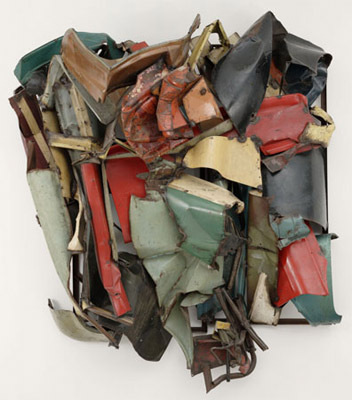 The diversity of methods and associations could encompass industrial procedures and techniques, especially in American art, as in the sculptures of crushed fragments of car bodies by John Chamberlain (born 1927) or in the lines formed from molten lead hurled against the junction of wall and floor by Richard Serra (born 1939). They could, however, also take a much more domestic or prosaic form, as in the Heap of coloured cloth presented as a sculpture by the English artist Barry Flanagan in 1968, or in the emphasis on ordinary methods of construction such as folding, tieing, stapling, stitching and bolting together in paintings by the English artists Richard Smith and Stephen Buckley (born 1944). 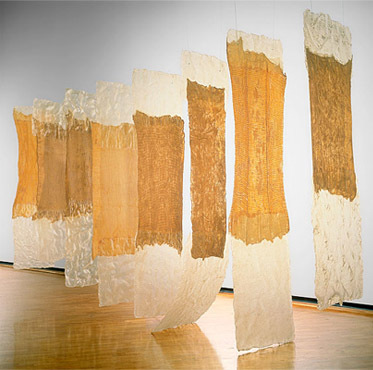 For the German-born American sculptor Eva Hesse (1936-70), the relationship established with the spectator through this open avowal of the act of making could entail the use of transparent materials such as fibreglass, which openly revealed their structure, and a metaphorical equivalence between organic-looking pendulous forms and the human body. For Joseph Beuys particular materials such as felt and fat conveyed an essentially private mythology-rooted in his wartime experiences of protection and survival when near death; his tendencies towards the esoteric were checked, however, by his innate sense for the qualities of different materials and for the emotive effects and physical sensations stimulated by sculptures on an environmental scale. One of his last major works, an installation titled Plight (1985) at the Anthony d'Offay gallery in London, involved the virtual sealing off of the interior in bundles of felt to create a still, silent, warm and almost claustrophobically sealed shelter or womb-like space. 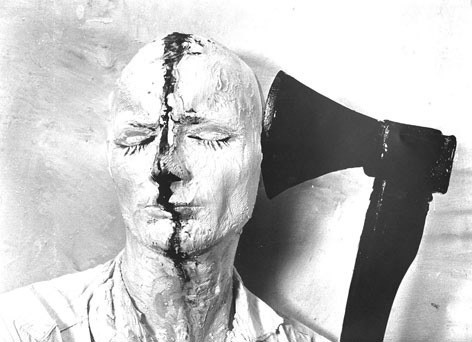 Through such works and occasional performances and lectures Beuys made a strong case for the transcendence of the spirit and of elemental forces over matter, presenting himself as a shaman. Without perhaps ever being fully understood, he remained an immensely influential figure, especially in Germany, for his insistence on art as an instrument capable of healing the wounds of society. For Beuys and other artists in the 1960s the gallery space was not merely a neutral or passive receptacle for art but an essential part of the art-work itself. 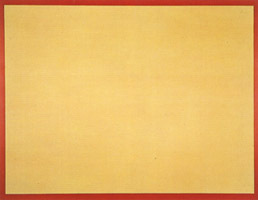 The role accorded to presentation by the Minimal artists, for instance, was not simply one of professionalism or commercial astuteness but a means of articulating the meaning of individual works and of their inter-relationships in a specific context; as Barnett Newman had earlier avowed with his term 'hereness', Minimal artists and composers such as Steve Reich and Philip Glass alike sought a concentration of perception and physical being on the immediate moment and thus on the particularity of the place. In the wake of this stress on the exhibition itself as the work of art, artists of diverse stylistic allegiances have placed emphasis on the installation as a whole rather than on its individual components. Environmental art in this specific sense had historical precedents, particularly in pre-Pop works by Claes Oldenburg such as The Street (i960) and The Store (1961), but what had begun as temporary displays in an almost theatrical context has since become the standard form for artists who otherwise have little in common stylistically or in terms of subject matter. The often mysterious installations by Jannis Kounellis, for example, tend to include traces of the actions by which they came into being, such as the singeing of the gallery walls by smoke. 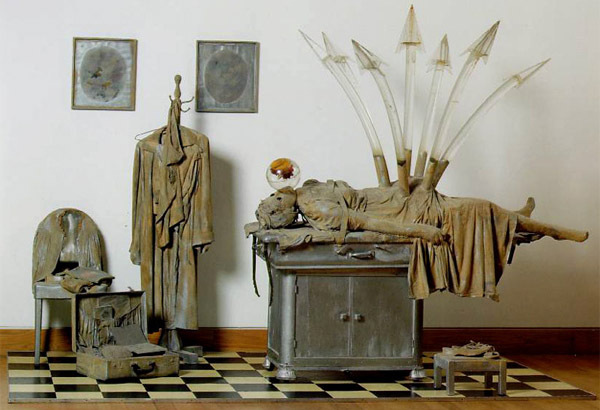 There is little basis on which to relate such works to the highly specific theatrical tableaux created by the American Edward Kienholz (born 1927) or the manifestations of dream imagery produced by a younger American, Jonathan Borofsky (born 1942). For each of them, however, the relationships established within the whole remain of greater importance than the constituent parts. By the late 1960s such concern with the work of art as a total environment, combined with a desire to remove art from the commercial manipulation and rarefied context of galleries and museums, had helped create the basis of a new art form known as Land art or Earth art. Works by its most notable practitioners, especially in the United States, often occupied a vast space in remote locations and involved the direct interaction of man and nature with the earth itself as a raw sculptural material. Given the vastness of North America and the availability of large stretches of desert and other uninhabited areas of land, it was perhaps inevitable that many of the major artists associated with the movement were American and that their works were often characterized by a grandeur of scale; such was the case with Michael Heizer (born 1944), Dennis Oppenheim (born 1938) and Walter De Maria (born 1935). Other artists, such as the Englishmen Richard Long (born 1945), Hamish Fulton (born 1946) and David Tremlett (born 1945), travelled to places as distant and inhospitable as Greenland and Tibet in search of a suitable location for a communion with nature. The implicit actions performed on the land were often direct and immediate, involving the digging or removal of soil or rock or the restructuring of a site into an elemental and symbolic form such as a spiral, as in works by Robert Smithson (1938-73) such as Spiral Jetty (a 1500-foot [457.2-metre] long coil of mud, salt crystals, rock and water at Rozel Point, Great Salt Lake, Utah, 1970) and Spiral Hill (a hill at Emmen, Holland, made of earth, black topsoil and white sand, measuring approximately 75 feet [22.8 metres] at its base, executed in 1971). 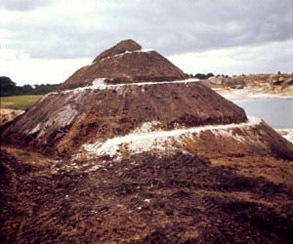 The forms taken by Land art could involve nothing more than the subtle relocation of natural elements indicating the passage of a human being through a hitherto untouched environment, as in works by Richard Long such as England (1968), which consisted of a large X shape made on a grassy field by the removal of the heads of daisies; these works, documented in photographs, were temporary by definition, since the cycles of mortality at work in nature were built into their very structure. 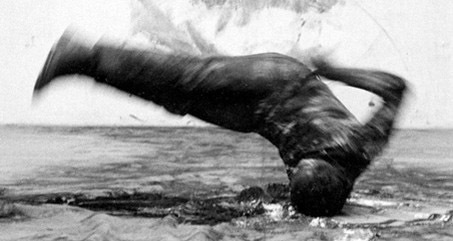 In this type of art it was often the case that the direct experience was afforded only to the artist himself, and it was left to the spectator's imagination to reconstruct its physical character by means of photographs, maps and written documentation of a sometimes overtly poetic nature, as in the work of Hamish Fulton. 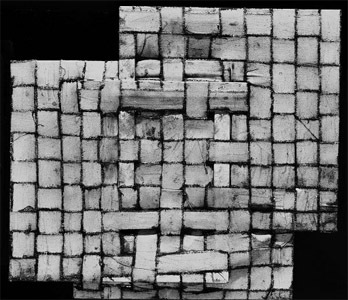 Long also produced works for installation in galleries, particularly floor pieces which bore some formal resemblance to the Minimal art of Andre but which made a specific connection through their materials � quantities of stone or driftwood - to specific natural locations as a way of connecting the two environments and the experiences which they represent. 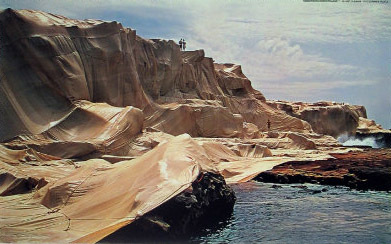 The preoccupations of other Land artists, particularly in the United States, were more overtly sculptural in a traditional sense, as in works by the Bulgarian-born artist Christo (born 1935) such as Wrapped Coast (Sydney, Australia, 1969) and Valley Curtain (Colorado, 1971), in which the shape and mass of large areas of land were articulated by massive quantities of cloth. 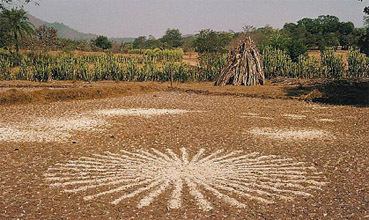 If much Land art indicated a nostalgic desire for an escape from civilization as well as from the corruption of art by its commercial exploitation, similar motivations encouraged the development of another art form during the 1960s: Performance art. 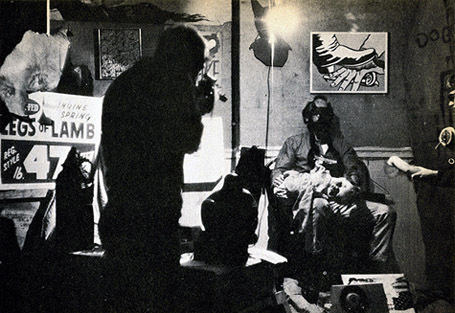 Although its origins can be traced to theatrical provocations early in the century by Futurists, Russian Constructivists, Dadaists, Surrealists and other Modernist artists, it was in the late 1950s that it began to take shape more explicitly as a means of making art in its own right, for example in the Happenings by New York artists associated with the origins of Pop art such as Allan Kaprow (born 1927), Claes Oldenburg, Jim Dine (born 1935), Red Grooms (born 1937), Robert Whitman (born 1935) and Robert Rauschenberg. 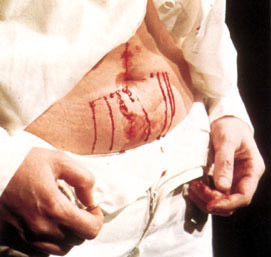 Performances could be gruelling experiences for the artist and audience alike, both physically and intellectually, as in works by Joseph Beuys such as How lo Explain Pictures to a Dead Hare and Twenty-jour Hours (both 1965), which demanded high levels of concentration and physical stamina as part of their confrontational nature and examination of consciousness. 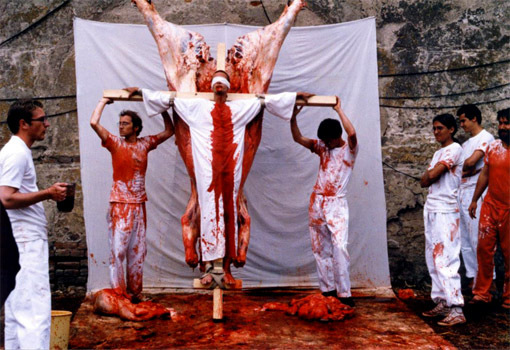 Feats of endurance and physical pain, to which especially Europeans such as Herman Nitsch (born 1938), Gunter Brus (born 1938), Arnulf Rainer (born 1929), Gina Pane (born 1939) and Stuart Brisley (born 1933) subjected their bodies, often had ritualistic and expressionist overtones as part of a purging of social or religious patterns of behaviour. Artists associated with Body Art, such as the Americans Scott Burton and Lucinda Childs, used the human figure as a sculptural element as part of a contemplation of time and space, while for others such as the Canadian group General Idea (formed in 1968 by A. 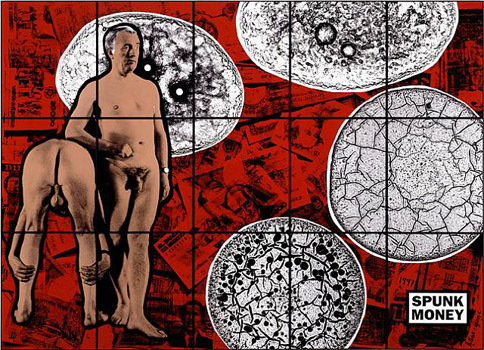 A. Bronson, Felix Partz and Jorge Zontal), the British team of Gilbert & George (born 1943 and 1942) and the Scottish artist Bruce McLean (born 1944) doses of humour and vaudeville provided a means of unmasking human behaviour and the pretensions of the art world. Performances could be improvised and spontaneous or as intricately scripted and visually exacting as the ambitious theatrical events staged by the American Robert Wilson (born 1941), such as his collaboration with the composer Philip Glass on the opera Einstein on the Beach (1976). Performance art, in other words, while never achieving a very wide public, proved to be as flexible and various as any art form in the styles, moods and themes which it was able to convey. 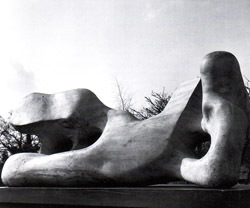 The ephemerality and lack of marketability which had initially attracted many artists to such work, however, in the end contributed to the marginalization of the form, and many of those associated with it turned again to the production of more conventional art'objects as sculptors or painters. Performance Art, while particularly lucid in its emphasis on action in time rather than on the creation of a finite object, was only one of several media which challenged traditional artistic priorities during this period. The Video art initiated early in the 1960s by the Korean Nam Jun Paik (born 1932) and others, while dependent on the physical sensations afforded by the latest technology, used television sets not as ends in themselves but as a means of transmitting a specifically contemporary experience of the modern world or of recording for posterity an otherwise transient performance. For Paik in particular the medium offered a suitable means of expressing and questioning the bombardment of the senses effected by the mass media. All such moves away from standard media, including Process art, Land art and Performance art, presaged a general emphasis in the later 1960s away from the object in favour of the generating idea. In its most extreme form, Conceptual art, the idea alone could be presented as the work of art. 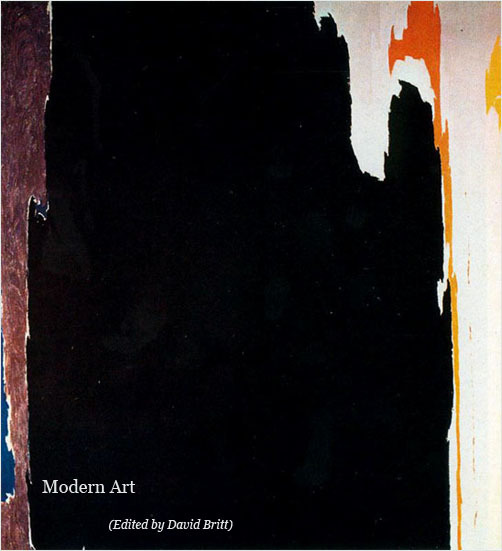 In an essay titled 'Art After Philosophy', published in Studio International in October 1969, the leading American exponent of Conceptual art, Joseph Kosuth (born 1945), cited Marcel Duchamp's invention of the 'unassisted Ready-made' as the single event which changed the focus of art from 'appearance' to 'conception', 'from the form of the language to what was being said'. 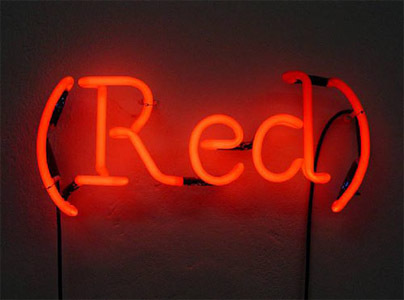 Kosuth's own work often relied on photographic enlargements of dictionary definitions presented as equivalents to real objects or to their representations in photographs. Much of Conceptual art was text-based, with the written word functioning as a replacement for visual signs, as in the handpainted phrases presented on gallery walls by the American Lawrence Weiner (born 1940); while much of this type of art was pedantically and ponderously intellectual, Weiner continued in his later works to use words for their visual suggestiveness, as in BILLOU'LXG CLOUDS OF FERROUS OXIDE SETTING APART A CORNER 0N THE BOTTOM OF THE SEA (1986), in the process making a strong case for the power of language and memory in conveying experience. 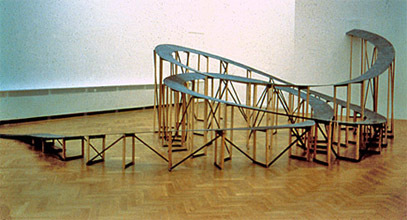 Another artist who relished paradoxical interchanges between words, objects and images was the Belgian Marcel Broodthaers (1924-76), whose Conceptualism was at least partly rooted in the paradoxes of the Surrealist Rene Magritte; for example in an installation titled La Salle Blanche (1975) he reconstructed in wood the surfaces of two rooms in his house on which he had inscribed references both to standard images in painting (shadow, sunlight, clouds) and to things used in the making and promotion of art (canvas, easel, gallery, percentage, museum). 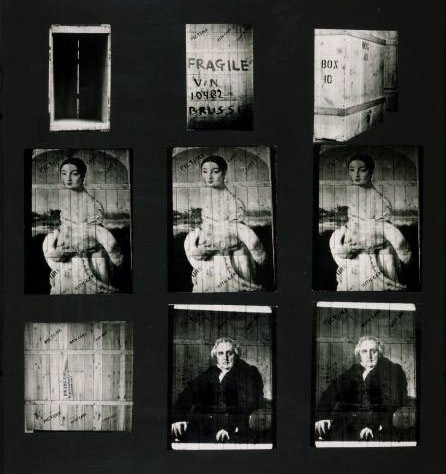 Conceptual Art, in spite of its apparent affront to the marketing of art objects, was severely dependent on its context in order to express its meaning; outside a gallery or museum it ran the risk of failing to be recognized as art. 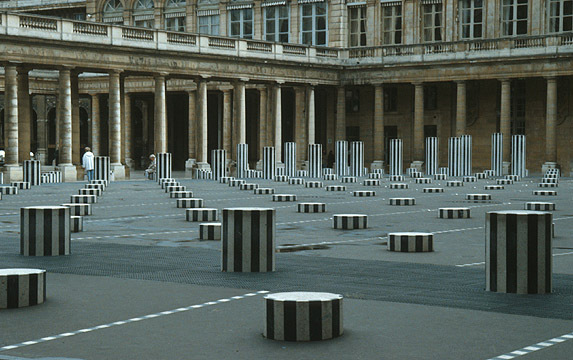 The leading French Conceptual artist, Daniel Buren (born 1938), turned this situation into a virtue by basing his work on the changes wrought by different environments to a single visual sign - a simple pattern of alternating stripes - which through constant use was paradoxically transformed from an anonymous image into his personal trademark. 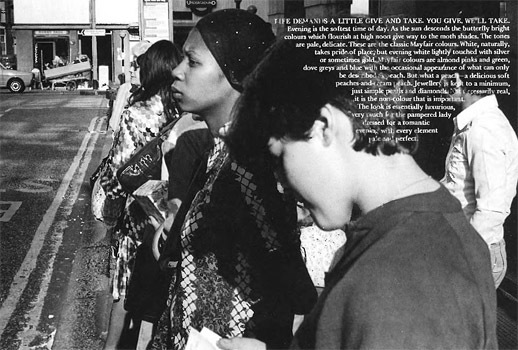 It was through words, however, that most Conceptual artists conveyed their ideas; one of the most active groups, Art and Language, even published its own magazine as a forum for its British and American members. 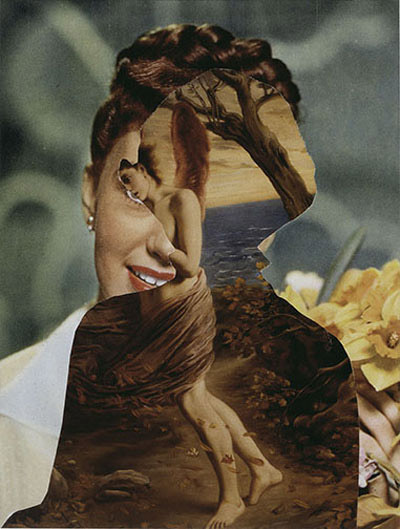 In England a variant of Conceptual art dependent on the relationships established between written texts and photographic images provided the structure for philosophical, social and political enquiry; among the practitioners of this type of art were Victor Burgin (born 1941), John Stezaker (born 1949) and Stephen Willats (born 1943). In the 1980s two Americans, Barbara Kruger (born 1945) and Jenny Holzer (born 1950), were among those who even more explicitly sought to decode the methods of advertising and the mass media in order to reverse the depersonalization and manipulation to which they generally subjected viewers assumed to be passive consumers.